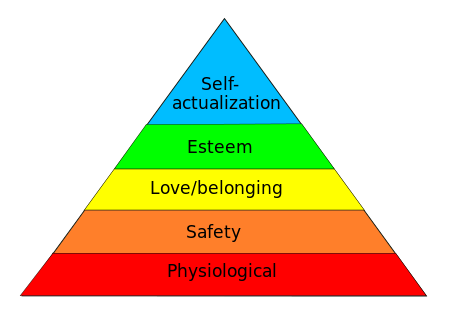 In the last post, we discussed Maslow’s hierarchy of needs. It’s a premise that a person must have basic foundational needs met before they can move on to relational, social and intellectual growth. Safety is a basic foundational need, on the pyramid it follows the physical needs of food, water, clothing and shelter, and health. Safety is not tangible or easy to quantify need. Complicating that, safety is a highly personalized perception. What one person considers safe, may completely terrorize another. It is easy to take our safety for granted until a situation arises that threatens us. Natural disasters: hurricane, blizzard, earthquake, drought, tsunami, extreme temperatures, and Political and Social situations: war, terrorism, political strife, poverty, crime and inequality; each bring primary needs like food, water, clothing and shelter to the forefront, along with safety concerns. Safety should be recognized and treated as a responsibility of an independent adult. That requires understanding the dynamics of situations we are in, which is easy to say, but can be difficult to pin down. Throughout the earlier years in a woman’s life, roles are fairly well defined. Depending on our health and what road we travel, we are first children, then student, partner, employee, mother, teacher, and caregiver well into the beginning of our elderly years. Physical changes occur gradually and differently for each woman, and our roles also shift at varying rates to less defined ones. Younger women begin to take up what had been our past responsibilities. We are becoming the grandmothers, retirees, elders and role models. At this stage of life, a woman is typically reliant on life partners, children, friends and those in professional capacities, church affiliates and society in general for her safety. More often than not, what an older woman is relying on is her perception of safety, not the reality of any given situation. She expects to be safe because she’s always been. . It’s not a problem of denial, it’s generally because nothing has happened to cause her to review. It’s an accepted fact that change becomes more difficult the older we get. Habits of a lifetime, and sometimes just the lack of energy required to change, affect our ability to respond to challenging and unexpected situations. Complications of health problems, medication, arthritis, vision and hearing loss can leave an older woman an easy target, or make responding to an emergency more difficult. Without attention to a positive proactive plan, fear will blossom. And again, fear tends to paralyze our ability to process and assess. The first step in gaining this awareness is keeping yourself in shape, physically and mentally. Paying attention to diet, exercising, getting quality sleep, is a good start. You’ve got to take care of those basic physiological needs before you can move up the pyramid ladder and take an active part in maintaining safety for you and yours. There’s work to do, and just because we’ve moved into our “golden years” doesn’t end that. The second step is accepting your responsibility for your safety, and those dependent on you for safety. So, ladies, where are you in meeting your responsibility for your own safety? Do you give any thought to it? Are your taking care of your basic physical needs? Who and what do you depend on to provide safety? Is it real? Or just a perception or wish? Do you routinely pay attention to your surroundings at home, work, shopping, traveling? If you find it difficult to answer any of these questions, try writing down your thoughts. Make a list, or begin a daily journal. How did you feel while you were out shopping, visiting, at church, home alone, traveling? Get to know when you are fearful, “zoning out” what is around you, or engaging with other people. Help yourself to understand what you are doing right here and now. Next post we’ll look at some specific physical, mental and emotional factors that may have an affect on our ability to remain safe. because it had its foundation on the rock. Situational Awareness: What is it? Situational Awareness is a component of self defense that belongs in everybody’s toolbox of personal preparedness. At its most basic level, it means being aware of, discerning, assessing and factoring in the elements – people, place, things, events, and even time – that are around you, and how you are or might soon be affected by them. Taken to the next step, training in responses available to cope with possible situations, and learning how to relate and react to situations. Situational Awareness is taking personal responsibility for where we are, what we encounter, and how we act. We have had many commonsense basics drilled into us in our youth. Why does that early training tend to fade and be forgotten so easily as we become adults? I think it’s because it’s not a vaccination you get as a baby that stays with you and lasts your lifetime. It’s more like the daily food and drink you ingest, to help you grow and keep you strong and healthy. You need to attend to it every day of your life, or — like the saying goes — If you don’t use it, you lose it. As parents we teach our children not to talk to strangers, look both ways before crossing the street, tell your parents where you’re going and when you are coming home. The responsibility for a child’s safety lies in the adults around them – family, neighbors, friends and professionals of “the Village” that protects and raises that child. During adolescence and the teen years, a shift begins. With new friendships and relationships, it’s a time of testing boundaries, and immersion in experiential activities. After high school, many kids go off to college, the military, or find jobs, marry, or take longer to leave the nest while finding their place in the world. But still the protective “shield/umbrella” of childhood lingers. Mentors coach them as they develop into adulthood. For young women these lessons are critical. Awareness of their surrounding, taking care of how they dress and learning not to put themselves in bad situations, checking in regularly and not going places alone, and some practical self defense classes help immensely. Once childhood is fully behind, chances are few keep their situational awareness a priority, unless a tragic or frightening situation is encountered. Many, but not all, tragedies might have been lessened or avoided if time had been spent developing a routine of awareness, which means taking responsibility for learning and knowing what surrounds or comes within your scope. Making that as much a part of life as the air you breathe and the food you eat. That sounds like setting a high, unattainable standard to some. Or maybe just plain paranoia. Afterall, just how important could all this attention on being safe? One theory that helps put that into perspective is psychologist Abraham Maslow’s hierarchy of needs, proposed first in 1943 in his paper “A Theory of Human Motivation”, and expanded and developed in his widely accepted 1954 book Motivation and Personality. And it has stood the test of time. A pyramid diagram has developed over the years since then, to illustrate his premise that the needs on the bottom (foundational) must be met before a person can experience the next level, and so forth. In this diagram, Safety is a foundational need, outranked only by basic physical needs like food, clothing, shelter. Safety is intangible and never permanent. How we perceive we are safe is highly individual, and can easily be a false sense. We may feel safe when we are in a group, when we have family close by, have trust in law enforcement and other professionals. But what happens when we are alone, traveling, out of touch, or someone or something interrupts that feeling of safety? When our trust that others will keep us safe is betrayed, or they are unavailable, or have left. This blog has posted in length about fear, and proposes fear typically incapacitates and interferes with our ability to respond appropriately or quickly to threats to our safety. Unless we have thought about and practiced what we need to do for a variety of potential incidents, we would have to formulate a response while under stress and duress. That doesn’t tip the odds in our favor very often. This is not a “preppie” or extreme survival issue alone. It is basic common sense for responsible adults. Next post will look specifically at factors women face as they grow older. We’ll look at reassessing things that have changed in your life, and some ideas to include situational awareness into your daily routine, specifically geared for our “golden” years. Summer has arrived, and I haven’t written in this blog in awhile, but I’m hopefully getting back into my routine. Before starting back in with the series on Ammunition Basics, I thought I would take a side road, and share an experience from this past weekend that got me thinking about how prepared I may or may not be for unexpected conditions. In order to be effective and prepared you can’t just confine yourself to how you draw or shoot your handgun. It must become an attitude you adopt in everything you do. Situations we run into in life are not clearly compartmentalized, and escalation is a potential whenever people are involved. When we encounter the unexpected we can quickly become confused, angry, and unable to or poorly process ideas. We will respond from the baseline of what we have always done, or of how we have trained. I have trained to be aware of what is around me, to anticipate and respond to perceived needs and threats. This weekend’s encounter emphasized that my training has not resulted in my being as situational ready as I would like to believe. What follows demonstrates I didn’t have as good a read on the situation as I would have hoped, and the flagger I will be discussing, didn’t demonstrate a very good response either. I am sure we are both well meaning, diligently trained persons, but neither of us got a “gold star” on this one. We normally don’t travel on major holiday weekends, but Friday the 4th of July our “ancient” hot water heater gave up the ghost. That meant a trip to Kalispell on Saturday, which is a little over a 100 mile drive each way. My husband had driven on the ride over, and after completing a few stops “while we were there,” I started the drive back home in the early afternoon. The first twenty or so miles of the highway between Kalispell and Libby after you leave the valley is a winding, hilly road, with only one lane in each direction and very little shoulder. The speed limit is 70 mph. After just a few minutes on this section, I rounded a blind corner and about 30 yards ahead on a straight stretch of about 100 yards two rescue vehicles with flashing lights were completely blocking the right hand lane. They were responding to a single vehicle rollover accident, and the car had come to a rest upside down in the steep roadside ditch, and the oncoming lane also had an abrupt dropoff with virtually no shoulder. No choice but to stop as quickly and safely as possible. No ambulance had arrived on the scene yet, and a Volunteer Fire Department flagger was talking on her radio while standing immediately behind the bright red fire rescue truck and highway patrol vehicle. As I neared, I saw the SLOW side of the sign facing in my direction, and continued to decelerate. I started to move over to the left hand lane, preparing to pass very slowly around the rescue truck, shifting my eyes off the flagger to make sure the road ahead was clear. When I looked back in the direction of the flagger, she was violently gesturing and waving the STOP at me. I can’t say when she had flipped the sign over, because my attention had been elsewhere. I immediately maneuvered back into the right hand lane, and came to a complete stop about 10-15 feet from her and to the rear of the patrol car. All this happened in seconds. With the yelling and her sign close to my face, I rolled the window back up. Infuriated even more, she whirled around and marched to the patrol vehicle, her sign dropped down at her side. The officer approached our vehicle, and motioned me to drive forward and stop behind the fire engine. By now my adrenalin was pumping and my voice was shaky and full of emotion and tears felt like they weren’t far off. I hate when that happens, but I managed to relay what had happened, and the patrolman told us the flagger was pretty jumpy because she was in a vulnerable situation. He waived us on our way without any further questioning. Ms. Volunteer Fire Department was obviously one of the first responders on the scene. I don’t know how much experience or training she’s had controlling traffic, but I suspect from the way she flagged traffic it’s not much. I base this on my own experience flagging with a road crew on a similar country highway. The 90+ degree heat of the day is intensified while standing on an asphalt roadway. Keeping a cool head is a must even under brutal conditions. I have no way of knowing what she had done or had seen and experienced on that response incident, or even how many duties she was responsible for in addition to flagging. I can only imagine how charged her nerves were. From that platform, a minor infraction elicited an explosive reaction. wouldn’t take my eyes off the flagger, and would stay in my lane until I had positive “eye contact” with the flagger, and receive a definite, affirmative motion to stop or proceed. Anticipating what someone wants you to do, and taking action on that assumption, even with the best of intentions, is not appropriate. While I rolled the window up reflexively in what felt at the time like reasonable self protection, chances are very slim she would have done more than just yell, or possibly pound on my truck in fury. Finally, I realize my reflexes and ability to process are not as quick as they were years ago. 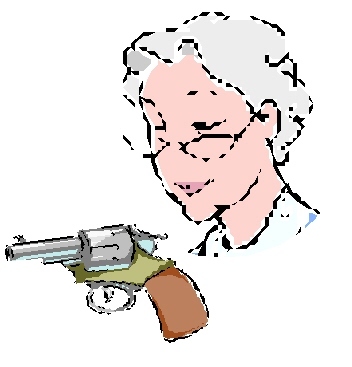 While I am currently healthy, have excellent vision, am mentally alert and physically active I believe I need to assess my physical and mental condition regularly to make sure I am a responsible driver, and likewise when decide to own and carry a gun. I pray I know when I reach the time to hang up my spurs, so to speak. Again, this was not in itself more than a wake up call. But the correlation to approaching a change in self defense practice is not a very big jump. My preparedness in an emergency/unexpected situation has been shown to need work. In practice it’s usual to focus on gun related aspects, how to shoot, maintain grip, stance, sight picture, follow through and so forth, and also maintaining vigilant awareness of the surroundings. But once adrenalin kicks in, decision making typically is compromised. It is good to know how I will react. Fight or Flight. Or, maybe cringe or cry. Training and reacting under adverse or less than ideal conditions is rarely done by most people during self defense practice sessions. But I know many trainers have advocated training in less than perfect lighting, weather conditions, and even stress producing situations, and recommend it be made part of regular self defense exercises. They now have my attention. Here is a great presentation of not only why this man has chosen to carry a gun, but also the stigma that can accompany that choice. Thanks to Semi on Target for a well done post!